I had the opportunity to live and work in Nicaragua from 1993 to 1994. I lived between my uncles house/my mother’s birthplace in Ciudad Dario and Granada . So whether I was in a bus, a bar, at a party, or in a market I probably heard this song on a daily basis. 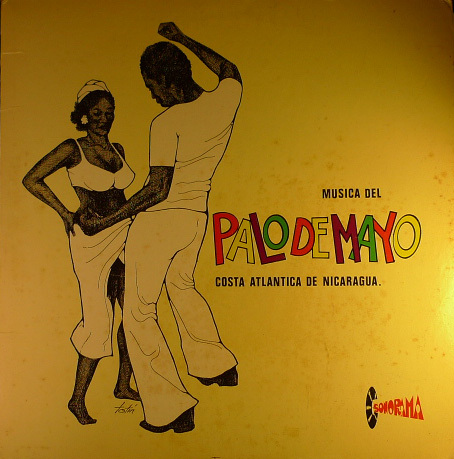 The genre of music is actually called Palo De Mayo (The May Pole) which is a month long May Day festival on the Carribean Coast of Central America. It originated in Bluefields Nicaragua in the 17th century and the celebration includes a maypole, which is a tall wooden pole, which is decorated with several long colored ribbons suspended from the top. The festival, the music, and the culture of the Atlantic coast of Nicaragua is in itself a potent cross-fertilization of African, Creole, Garifuna, Jamaican/Caribbean, Indigenous, and Latin cultures. The song really sounds like a mixture of traditional African rhythms, soca, paranda and Calypso style music. From what I understand, Grupo Gamma probably made a living playing parties and going door to door playing their music in the month of May. The song Tu lu lu lu pasa (to pass) basically is naming off the people coming, going, passing (be it in life, death, or dance I suppose). There are various versions of the song, always naming someone different and I’ve heard a faster merengue version as well. I was just in Bluefields for the final weekend of May and heard the Dimension Costena version of Tululu a million times, but I have never heard this version before. Do you know if this Gamma version is with the same singer, Anthony Matthews, from the Dimension Costena version? I saw someone say that on a message board but I couldn’t confirm it. Outstanding blog by the way! Yeah Dimension Costena is another big name Nicarguan group (more salseros than anything else) and they are from the atlantic coast as well. But I couldnt tell you if the singer is the same or not, sorry. Nevertheless, it’s funny to know that you heard tululu over a million times. I swear its all i ever hear when I visit Nicaragua. Saludos! having the record in my hand, i can confirm that anthony matthews is the singer. I’m consistently getting reminded how fascinating Central America and its amazing blend of cultures and ethnicities is. Are there a lot of records to be found in Nicaragua? Yeah, when I was there in 1993-94 I wasn’t as big as a collector as I turned out to be. Also I was broke. So I really wasn’t digging. I found a some communist/sandinsta era propaganda records, a few which I still have. Maybe i’ll post a snippet of one of those. I was a young Marine at the American Embassy in 1993 and fell in love with the Dimension Costena Group! I had the opportunity to meet and talk to Anthony on several occasions. At one concert in Managua he called me up on stage by name to dance with his dancers to Tu lu lu Pasa! Those were great times in Managua in the 90’s. I miss that country. I own the Album, but would love to get the music in a CD or something. Any suggestions?